Same chord progression as before: C-7 A-7 F#-7 Eb-7. But this time applied to the available triads within the Dorian mode. Try to notice patterns within the picture. For instance, you can see that there are pairs of minor triads next to each other. Also there are pairs of major triads. What other patterns can you see? Maybe you could arpeggiate the chords to make a line? 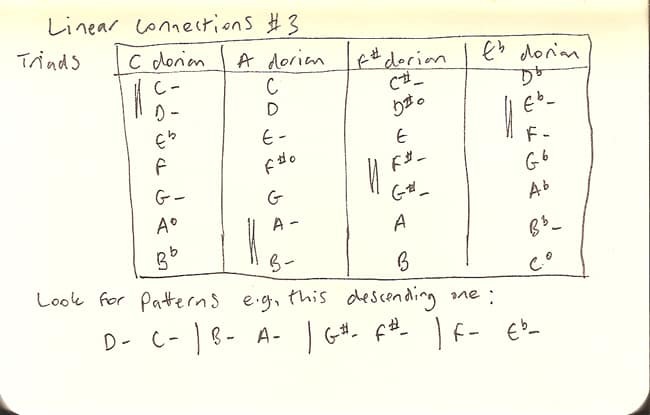 Notice the pattern that the descending minor triads makes: two triads that are a tone apart (D- and C-), and when you change chord (C-7 to A-7) the link between the triads is a semi-tone C- to B-). Allusions to the diminished sound, maybe. Maybe you could mix the dorian triads sound with the diminished sound. Maybe you could use the triads that are the wrong ones for a chord (for C-7 that’d be A- B- F#- G#- Eb- F-) and resolve them to diatonic triads, using that idea of a way of getting an unusual sound that has some semblance of organisation in it. Or maybe just a start point for something to mess about with until you find something interesting.